Alan M. MacRobert's excellent article on the religous--beyond reason--nature of New-Age beliefs. 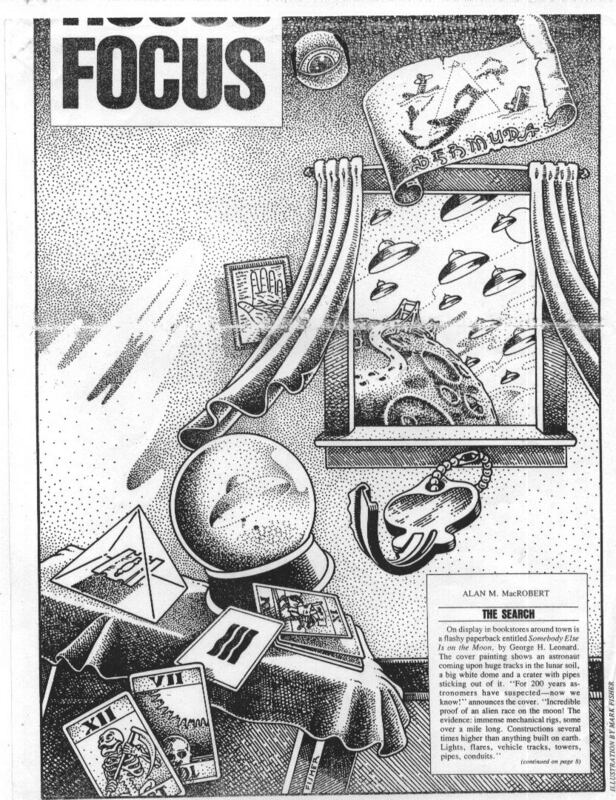 Reprinted from "Real Paper", 1979, and reprinted in the March 28, 1979 issue of "Reader" of San Diego. An historical account of the new-age, spiritualistic poppycock. VERY INSIGHTFUL, THE MARRIAGE OF JOURNALISM AND LOGIC. GREAT READING!!! On display in bookstores around town is a flashy paperback entitled Somebody Else Is on the Moon, by George H. Leonard. The cover painting shows an astronaut coming upon huge tracks in the lunar soil, a big, white dome and a crater with pipes sticking out of it. For 200 years astronomers have suspectednow we know! announces the cover. Incredible proof of an alien race on the moon! The evidence: immense mechanical rigs, some over a mile long. Constructions several times higher than anything built on earth. Lights, flares, vehicle tracks, towers, pipes, conduits. A book like this simply begs to be bought. Anyone who believes the cover blurbs will feel ripped off as soon as he starts reading, but to the connoisseur of a certain type of literature the book is a delight. It is a rambling, highly personal narrative of how the author sees amazing things in photographs of the moon. He gets them mail order from NASA. The chapters bear such titles as A Motor As Big As the Bronx, Service Station in a Crater? and If They Arent Dust Clouds and Mists, What Are They? Thirty-five pages of moon photos with circles and arrows illustrate the marvels discussed in the text. Unfortunately, squint and stare as you will, the circles and arrows point to nothing at all. The photos are ordinary moonscapes of hills, plains, and craters. One faraway perspective of rolling hills is captioned, Power source plate with knobs and cord at right, and constructions and gas spray at lower center. Another distant view of hills is supposed to show small craters in the process of being worked on with marking crosses on their lips and spraying drones inside. Also notice X-drone and puff-like orbs. Under a fuzzy picture of a boulder field is the explanation, Manufactured objects and vehicle are visible in Mare Tranquillitatis. At one point Leonard vents his frustration at being unable to figure it all out. Operation Cover-up is a common theme on the moon, he pouts. Sometimes, in examining closely a particular patch of ground, one gets the feeling that everything is fake, sham; that the moons occupants do not wish us to see the surface for what it really is. The biggest cover-up, of course, is by NASA (even though the agency freely gave Leonard the telltale photos). Did we pay $27 billion to learn that a rock from the highland breccia is almost 4.1 billion years old? he asks. Obviously not. Astronauts flew to the moon to study its inhabitants and everything else is a government charade that dwarfs Watergate. Someone Else Is on the Moon does not deserve the title of borderland science or New Age research or any of the other such terms that have lately become fashionable. It is the work of a grade-A crackpot. There have always been crackpots around, but the mass marketing of Leonards book is one small symptom of an enormous shift that has taken place in American popular thought. Never before would a reputable publishing house like Simon and Schuster have had the chutzpah to print Somebody Else Is on the Moon, place is in the Science and Nature section of bookstores everywhere, and put this sell line on the opening page: What NASA knows but wont divulge! With careful logic and reason, George Leonard has studied all the data to prove his theory of a highly advanced underground civilization that is working the face of the moon. Not until the Seventies, that is. In times past, purveyors of paranormal ideas used to charge bitterly that they were being censored out of print by conspiracies of publishers and orthodox scientists. No more; all holds are off. Sunken continents, ancient astronauts, colliding planets, pyramid power, astrology, scores of holistic health beliefs, undersea UFO bases, and a thousand similar ideas are getting a hearing in America like never before. To someone who confronts the question of whether a few of these things might actually be true, and just about everyone does sooner or later, this presents a dilemma. Never has discussion of the paranormal come so far out of the closet, but never has so much garbage spilled out as well. Rather than providing more information from which to judge, this no-holds-barred atmosphere has made the Search, as devotees of the paranormal call it, more confusing than ever. The Search has been a part of my own life about as long as I can remember. It runs in the family, as a matter of fact. My grandfather was a devout spiritualist. He held seances with the great mediums of the day--Arthur Ford, Eileen Garrettand he took my mother and father to all the famous spiritualist camps. My parents were more skeptical. My father joined the American Society for Psychical Research and became one of its directors. He investigated haunted houses, poltergeists, clairvoyants, and telepaths long before such investigators were the stars of TV shows. Up in the attic we still have a set of fake spirit photographs a medium tried to pass off on him; spirit photography was the popular equivalent in those days of key-bending. All this was part of the background of my childhood. Some of my earliest reading materials were the psychic books that filled our familys bookcases. In one of them, I ran across an engraving of my great-grandfather Emerson J. Mac Robert, a spiritualist in London, Ontario. He had held seances in the top-floor room of an old house with velvet tacked over the windows at a time when holding a seance was seen as a scandalous thing so do. Word got out and he was nearly forced from his post on the London School Board by righteous churchgoers. I also ran across an old reference to something called the Treborcam ethereal healing machine. The name is my own spelled backwards. There were times when I believed in is all and times when I didnt. My father was always noncommittal. He had run across plenty of frauds and exaggerations, but aside from them, unlike on the TV shows, the best the Society for Psychical Research seemed able to do, year after year, was draw a blank. Usually someone claiming to have one paranormal power or another would explain that he was just having a bad day when he failed objective tests. Or only where nobody was around to check closely. Sometimes a psychic who flopped tests would nevertheless milk public from the fact that his powers had been tested by the American Society for Psychical Research. The more carefully the investigators checked, he says, the more phenomena were not there. The longer Ive followed the whole subject, the more Ive seen of this same thing. I have come through the Sea somewhat disillusioned, totally impatient with the intellectual mushiness that lets much flummery pass as the real thing, still ready for the day when UFO creatures land on the White House lawn and interviewed by Walter Cronkite, or when one single psychic somewhere can predict the future or levitate paper clips reliably that anyone can see its so. If anybody picked up this paper hoping for the word that psychic power exists, I am sorry to disappoint you. In the meanwhile here, culled from all the time Ive spent in the Search, are some guidelines by which to evaluate the flood of paranormal clams as they roll in. These guidelines, carefully applied, should help eliminate claims that are worthlessat least ninety-five percentand will provide grounds evaluating anything thats left. Almost everyone with a paranormal theory to tout, you will discover, is willing to scrutinize the phenomena. Whatever hes claiming, hes liable not examine it too closely even when he g an excellent chance. You get the impression that these people are afraid deep do theyll see theres nothing there. Theyll talk about the inadequacy of the linear, Western-scientific mind and so on, but lets get a handle on that. Science is linear men in white coats with test tubes. Science is merely the ort of looking carefully. The test tubes are just a means to test that end. What most paranormal advocates when they condemn Western scientific attitudes, as they almost always do, that they are afraid of being looked carefully. An example: A few years ago when pyramid power movement was at height, it was widely claimed that a razor blade would grow sharp if kept in a pyramid. Countless pyramid freaks and fellow-traveler journalists said in countless publications that yes, they really got more shaves from a razor blade stored in a pyramid. But, as every man knows who has run out of blades as an inconvenient time, even a very dull blade will last if you want it to. Its a very poor test. The thing so do would have been to look at the blade under a microscope instead. In a high-power microscope a dull razor edge looks like the Rocky Mountains. If the Rocky Mountains knit back into a clean, smooth edge inside the pyramid, defying all the laws of physics before your very eyes, you would have something. If the blade just sat there, pyramid power would come down a peg. No pyramid writer to my knowledge has ever done this. It never seems so have even occurred to them. Perhaps they were too afraid of disappointment. You will spot this theme everywhere in the world of the paranormal once you start looking for is. Somebody Else Is on the Moon contains a fine example. All of Leonards moon constructions are at the very limit of resolution of the photos. When he had a chance to get better photos and see the terrain more clearly, he didnt. One of his pictures is supposed to show miles-long bridges. The photo is a very distant shot, hardly better than the view in a telescope from earth, and the bridges are the vaguest smudges. Most of Leonards other photos are close-ups of just a few miles of lunar terrain. Equally good close-ups have been taken of she bridge areas, and if the bridges were there, they would reach from one side of the frame to the other like a wall poster of the Golden Gate. For some reason Leonard did not get those particular close-ups, readily available from NASA. He was unwilling so look carefully. Heres another instance, an example of the peculiar dullness that overcomes so many paranormal followers when they have a chance to confront the question, Is this so? The planet Venus has figured in practically every psychic and astral travel movement since Emanuel Swedenborg in the middle of the Eighteenth Century. The psychics usually got messages that Venus has a climate and wildlife rather like the Garden of Eden. Sometimes they went there in their astral bodies and saw for themselves. A few years ago the first spacecraft flew to Venus. The planet turned out to be a horrible place. Its always 900 degrees Fahrenheit, the air pressure is as heavy as under more than 2500 feet of ocean, and the clouds are made of sulfuric acid. As Carl Sagan has noted, this serves so calibrate the accuracy of psychic messages and astral travel reports, giving us a means so judge how valid they are for places we cannot so readily check. Mentioning this will not make you any friends in psychic circles. They completely missed the lesson of Venus. Mystics are still getting messages from, and sending their astral bodies to, a tropical-garden Venus, and the Church of she New Jerusalem (Swedenborgian) is still in business. When my father was investigating mediums, they often claimed that the spirits would stay away if there was a skeptic in the room. So if an investigator frisked the medium for gadgets the spirits would fail so materialize. This is a very elegant explanation for why paranormal phenomena disappear when someone looks closely, and it is invoked in many ways by many people. Maybe its true: the concept is set up so that its impossible ever to be disproved. But a simpler explanation for why something isnt there when you look carefully is that it isnt there at all. Beware of anyone who says you mustnt look closely. Apply this guideline and many alleged mysteries will come clear. Noise in this sense means any kind of confusion, static, or fuzz that obscures what youre looking for. Leonards moon marvels are an example, lost as they are in the details of his photographs where everything gets fuzzy and random. A recent TV show promoting she paranormal featured a tape recording that reviewers were sold contained voices of spirits in a graveyard. If there really were any voices on the tape, they were well cloaked in the noise of the wind on the microphone. Why? Another example comes from the Journal of the American Society for Psychical Research on my fathers bookshelves. One psychic investigator theorized that psychokinesisthe minds alleged ability to move objects by will powermight depend on what elements are in the objects. Zinc might respond differently than zirconium. The straightforward way to teat this would be so suspend a piece of each element in such a way that the slightest force would move it, then sit back and concentrate on each one and see which moves the most in response. Of course, the objects would probably sit there and do nothing. The experimenter seemed so realize this. So instead, he made dice out of different elements and rolled then thousands of times down a sloping board, concentrating on what numbers he wanted to turn up. Note that the amount of force needed so turn a bouncing die is far greater than the force needed, say, to deflect a needle suspended on a thread in a vacuum. But the rolling of dice added statistical noise to the experiment, giving the experimenter something so work with. His results were not outstanding, but with an experiment like that you can fiddle around endlessly matching good and bad runs to your mood, the weather, the phases of the moon, and so on, making a nice thick report for the psychical research journal. Virtually every classic ESP test involves a great deal of statistical noisedice rolling, card guessingand we have a right so wonder why. If ESP were really there, it could be detected in clearer ways. Any legitimate researcher, no matter what his field of study, always tries to eliminate the noise from his data. None will needlessly cloak their data in noise, unless trying, perhaps unconsciously, to cover up the fact that maybe theres nothing there. Once you get the hang of checking the data-so-noise ratio, is can be applied in many ways. Take, for instance, the shroud of Turin. The shroud is an ancient cloth bearing the vague image of a mournful-looking man. Isis widely claimed to be the shroud that wrapped Jesus, imprinted by a miracle. It turned up in a church in the Middle Ages; its earlier history is unknown. The trouble is, whole museum loads of false relics also come out of the early Middle Ages, when practically every church had to have a piece of the True Cross, a plate from the Last Supper, one of Jesus sandals, and so forth. The shroud appeared in the middle of all this noise, any single item of which would be as hard to evaluate as the shroud itself. Ray N. Rogers, a leading shroud advocate, has said-he can hardly think of a better way, if you were a deity, so prove your existence to a skeptical modern world than by leaving us the shroud. I can think of plenty of better ways. You could do something clean and clear, like materializing as a figure fifty miles tall and speaking loud enough to shake the Great Pyramid. That would make people take notice. The shroud is a pretty forlorn miracle by comparison, since it is lost in she trivia of the-Middle Ages like a needle in a haystack (which, by the way, is the perfect example of a data-to-noise problem). This is not proof that the shroud is not what its cracked up to be, or that mind power didnt occasionally tilt a zirconium die, or that the moon is not covered with artificial objects just a little smaller than the best photographs can show. Noise in information theory means, literally, you dont know. But data swamped in noise are unworthy of belief, and when the evidence of the paranormal is so consistently cloaked this way, you have a right to wonder why. The human mind is an amazing thing. Put something in, and it comes out magically transformed. A believer doesnt have to be a zealot. Anyone qualifies who deep down might get excited at the idea that maybe that mysterious crashing noise in the woods beyond the campfire is Big foot. Whenever a newspaper has invented a land, lake, or sea monster as a hoax intelligent, rational people often come forward who swear they saw it. Anyone can work the believers magic.